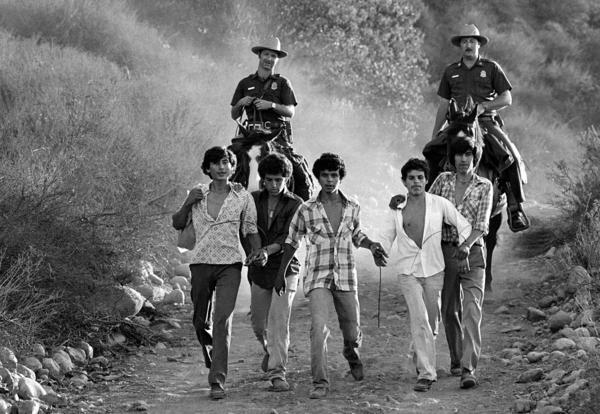 U.S. Border Patrolmen Steve Shields (left) and Ed Pyeatt march five people to a holding center in Texas shortly after their apprehension in the desert in 1981. "That person can make seven, eight, perhaps even 10 times more than they make in Mexico," says Jorge Castañeda, Mexico's former foreign minister. As more people came into the U.S. to find work, Mexicans became a larger percentage of the workforce. "Mexican immigration is something from our grandparents' era," says Michael Clemens, an economist at the Center for Global Development. "The fraction of the labor force in Kansas that was Mexican in 1929 was higher than it was in 1990. The same is true of Arizona. The same is true of New Mexico." During World War II, the federal government created a legal system for Mexican farmworkers to come work in the U.S. It was called the Bracero program, and its advocates were growers who wanted a ready supply of farm labor. In its peak year, it brought in 400,000 legal workers nationwide. Critics said the Bracero program cost American farmworkers jobs. It was problematic in other ways, too. For one, workers were bound to one employer. "That person had total control over your life," says Doris Meissner, former commissioner for the U.S. Immigration and Naturalization Service. "And that leads to a very unequal relationship, and it's a recipe for exploitation." Another criticism of the program was that it was thought to depress the wages of American workers. President John F. Kennedy campaigned against the Bracero program, and his successor, Lyndon Johnson, ended it in 1965. It was not replaced. "What came then was the market operating, which is people coming to the country anyway because the jobs were here, the relationships existed between Mexico and the United States, and there was limited enforcement across the Southwest border," Meissner says. While it was a crime to bring unauthorized migrants into the country or harbor them, under a federal law passed in 1952 it was not a crime to employ them. By 1980, the number of people in the U.S. without authorization had grown to 1.5 million. That decade witnessed what Clemens calls a demographic and economic perfect storm. A Mexican economic crisis sent many young Mexicans looking for work, while a booming U.S. economy meant fewer young Americans were entering the workforce. By 1986, there were 3.2 million unauthorized people in the U.S., prompting action from Congress. The Simpson-Mazzoli Act was introduced as a way to end illegal border crossings once and for all. It had three parts: Give amnesty to those who had been in the country for at least five years, crack down on employers who hire people who can't legally work here, and pump up border security to prevent future illegal crossings. President Reagan supported the bill and signed it into law in 1986. Three million people were granted amnesty under the Simpson-Mazzoli Act, but by 1990 the number of unauthorized immigrants was back up to 3.5 million. "Border enforcement never really kicked in in any significant way until about a decade later — the mid '90s," Meissner says. "Then, the real centerpiece of it, which was employer sanctions, was very weak. There was not really an effective way to enforce employer sanctions and lots of ways for both employers and workers to get around it." Moreover, those who had been in the U.S. less than five years weren't eligible for the amnesty. "So those people who couldn't apply for the legalization program became the seedbed for today's 11 million," Meissner says. 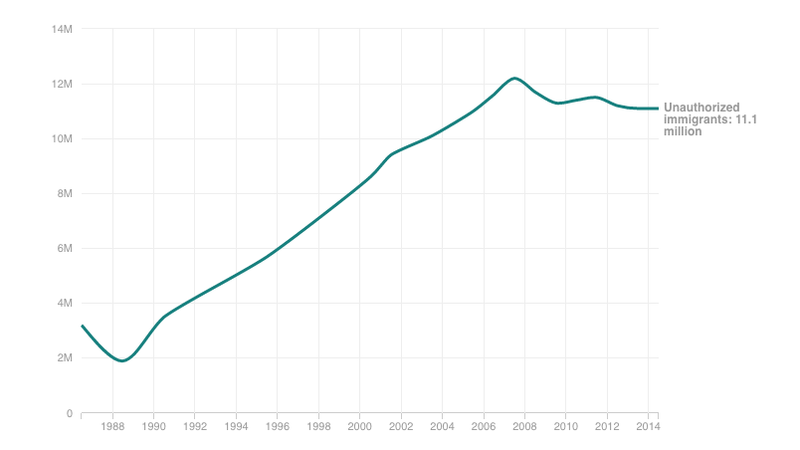 The U.S enjoyed huge economic expansion through the 1990s, which sent the number of unauthorized immigrants soaring. According to the Pew Research Center, by 1995, despite increased border enforcement, the population hit 5.7 million. As it became more difficult and dangerous for migrants to go back and forth between their homes in Mexico and jobs in the U.S., many of them stayed in the U.S. The growth continued, reaching 8.6 million in the year 2000. "Things slowed down a little bit with the recession in 2001 to ," Passel says. "And then the flows picked up again as the economy heated up through 2006 to ." It was then that the country hit the highest number — more than 12 million. "With the onset of the Great Recession, the flows ceased, pretty much, for a couple of years," Passel says. "After 2009, the U.S. economy expanded, unemployment rates went down, but the unauthorized flows did not pick up again." The number has been around 11 million for almost a decade. Today, the population of unauthorized immigrants is more urban, less seasonal and less Mexican than it used to be. About 52 percent are from Mexico, and the population is less single and male than before. "At this point, the unauthorized immigrant population is largely a family-based population," Passel says. "About half of the unauthorized immigrant adults in the United States have U.S.-born children." An estimated 40 percent of unauthorized immigrants did not sneak into the country; they entered legally and overstayed their visas. The work they do has changed from being strictly agricultural to a range of mostly low-wage, low-skilled jobs such as landscaping, meat rendering and back kitchen work in restaurants. All Things Considered editor Andrea Hsu and intern Esteban Bustillos contributed to this report. A big policy question facing the country is what to do with the 11 million immigrants who are in the United States illegally - today the story of how that population grew so large. It's a long story. It's mostly about Mexico, and it's full of unintended consequences. SIEGEL: From the 1940s until 1965, there was a program for Mexican agricultural guest workers. It was called the Bracero Program. UNIDENTIFIED MAN #1: Braceros - in Spanish, this means a man who works with his arms and hands. SIEGEL: Its advocates were growers who wanted a ready supply of farm labor - critics said at the expense of American farm workers. In 1959, the Council of California Growers had this short film produced to promote and defend the program. Here the narrator questions a man who recruited Mexican farm workers. UNIDENTIFIED MAN #1: Would you mind answering a few questions for us, sir? UNIDENTIFIED MAN #2: Yes, I'd be glad to answer them. UNIDENTIFIED MAN #1: Do you get a great many requests for foreign farm workers, braceros? UNIDENTIFIED MAN #2: I'd have to say no to that question. SIEGEL: In fact, that year, the program was near its peak, bringing in over 400,000 workers nationwide legally. But there were problems. For one, workers could only work for one employer. Here's former U.S. Immigration Commissioner Doris Meissner. DORIS MEISSNER: That person had total control over your life, and that leads to a very unequal relationship. And it's a recipe for exploitation. SIEGEL: Another criticism of the Bracero Program was that it was thought to depress the wages of American workers. That was the objection of America's next president. MICHAEL CLEMENS: John F. Kennedy campaigns to kill the Bracero Program. SIEGEL: That's economist Michael Clemens of the Center for Global Development. CLEMENS: The reason that he did that was to improve the wages and employment prospects for U.S. farm workers. Lyndon Johnson did it for that reason, got rid of the Bracero Program. MEISSNER: And in its place - nothing. SIEGEL: Doris Meissner had been an immigration lawyer at the Department of Justice. She rose to lead the Immigration and Naturalization Service under President Clinton. The end of the Bracero Program in 1965 did not end U.S. demand for low-skilled labor. What had been legal just became illegal. MEISSNER: What came then was the market operating, which is people coming to the country anyway because the jobs were here. The relationships existed between Mexico and the United States, and there was limited enforcement across the southwest border. SIEGEL: And here's a twist. While it was a crime to bring unauthorized migrants into the country or harbor them, it was not a crime to employ them. That was clearly stated in a federal law passed in 1952. By 1980, the number of unauthorized immigrants from Mexico in the U.S. was an estimated 1 and a half million, and it was about to balloon. The '80s witnessed what economist Michael Clemens calls a demographic an economic perfect storm - a Mexican economic crisis with lots of young Mexicans looking for work and a booming U.S. economy with fewer young Americans entering the workforce. CLEMENS: Both of those things generated an opportunity for mutually beneficial exchange between the countries - a lot more people than jobs in Mexico, a lot more jobs than people in the United States. SIEGEL: More Mexicans headed north. Jorge Castaneda is a Mexican political scientist. JORGE CASTANEDA: It makes an enormous amount of economic sense for any person in Mexico who has the drive and the money to go to the United States with or without papers to do so. That person can make seven, eight, perhaps even 10 times more than they make in Mexico. SIEGEL: By 1986, an estimated 3 million immigrants were here illegally, and Washington acted. There was a bill that included the legalization of migrants who had been in the country for a few years, and President Ronald Reagan supported it. RONALD REAGAN: I believe in the idea of amnesty for those who have put down roots and who have lived here even though some time back there they may have entered illegally. SIEGEL: It was known as the Simpson-Mazzoli Act for its sponsors, Republican Senator Alan Simpson and Democratic Congressman Roman Mazzoli. It was intended to stop illegal border crossings for once and for all. Here's Doris Meissner. MEISSNER: The bill called for what Senator Simpson liked to say always was the three-legged stool. The three-legged stool was increased border enforcement, accountability by employers. It was the first time anything in the law made it illegal for employers to employ people that didn't have legal status in the country - and then a legalization program. SIEGEL: Three million people took advantage of the amnesty, but just four years later, the government estimated there were more undocumented immigrants in the country - 3 and a half million - than there had been before the law. What went wrong? MEISSNER: Border enforcement never really kicked in in any significant way until about a decade later, the mid-90s. Then the real centerpiece of it, which was employer sanctions, was very weak. There was not really an effective way to enforce employer sanctions and lots of ways for both employers and workers to get around it. SIEGEL: And the amnesty left out those who had been here less than five years. MEISSNER: So those people who couldn't apply for the legalization program became the seed bed for today's 11 million. SIEGEL: The 1990s brought a new economic relationship between the two countries. UNIDENTIFIED MAN #3: To sign the North American Free Trade Agreement between the U.S., Mexico and Canada. SIEGEL: NAFTA was signed by President George H.W. Bush, and after it took effect, cheap U.S. corn drove many Mexican small farmers out of business. Some went north where jobs for unskilled workers in the U.S. were more plentiful than ever. MEISSNER: We had the longest period of job creation in the 1990s that we've had since the second world war. A lot of that job creation continued to be in the services sector, in the lower-wage sectors. SIEGEL: The Pew Research Center estimated that by 1995 there were 5.7 million unauthorized immigrants. That year, President Bill Clinton spoke of Americans being rightly disturbed by their numbers. SIEGEL: More border security had one unintended consequence. Jorge Castaneda says migrants used to travel back and forth annually between their jobs in America and their homes in Mexico. CASTANEDA: It became much more difficult and dangerous and expensive for people to go home for Christmas, so to speak, and go back to the U.S. in January. So they stayed. SIEGEL: And by the year 2000, their numbers had grown to 8.6 million. The next year, President George W. Bush took office. GEORGE W BUSH: We are welcoming a new day in the relationship between America and Mexico. SIEGEL: Bush wanted a new immigration law, and so did Mexican President Vicente Fox. Jorge Castaneda was his foreign minister. CASTANEDA: We had been, you know, the darling in Washington's eyes those first eight months of the Bush administration. President Bush made his first trip abroad to Mexico, and the first state visit that he held in Washington at the White House was by President Fox. These were both totally unprecedented events. SIEGEL: A new deal for Mexican migration seemed likely, but on September 11 of 2001, immigration was relegated to the back burner. Border policy was subsumed by a new rubric in American discourse, homeland security. Pushes for a comprehensive immigration reform bill failed under both Presidents Bush and Obama. The undocumented population reached 12 million and dipped after the Great Recession to 11 million. That's almost 3 percent of the U.S. population. The population of unauthorized immigrants is more urban than it used to be, less seasonal and less Mexican. Today about 52 percent are from Mexico. An estimated 40 percent of the 11 million did not sneak into the country. They entered legally and overstayed their visas. The issue of low-skilled migrants entering the country has proved intractable for Washington. But Michael Clemens of the Center for Global Development says one thing it isn't is new. CLEMENS: Mexican immigration is something from our grandparents' era. It's been going on since the 1920s. The fraction of the labor force in Kansas that was Mexican in 1929 was higher than it was in 1990. The same is true of Arizona. The same is true of New Mexico. SIEGEL: I asked Doris Meissner how she understands the rise of the unauthorized population to a colossal 11 million. MEISSNER: Our laws have not been aligned with our economy for at least 25 years and possibly longer. SIEGEL: Tomorrow we'll ask with that in mind, why can't the U.S. government pass a new immigration law? (SOUNDBITE OF CALEXICO SONG, "EPIC") Transcript provided by NPR, Copyright NPR.